Following three poorly received instalments and two franchise reboots courtesy of Sony Pictures, there’s a lot riding on Spider-Man’s (Tom Holland) prodigal return to the Marvel stable, a near miracle in itself of cross-studio collaboration. Indeed, though the words, “with great power comes great responsibility” are never actually spoken in Spider-Man: Homecoming, the mantra weighs as heavily on the production as it does its hero. Smartly, Homecoming undercuts expectations of going bigger and more bombastic by opening with a do-over of the airport scene in Captain America: Civil War, replayed as a very funny home video. Setting the tone for a laid-back, youthful take on our hero, the film picks up immediately after the events of Civil War, with Peter Parker back to normality contending with the trials of high-school life and the sophomoric frustrations of not being a full-time Avenger. Fears that Iron Man‘s (Robert Downey Jr.) presence might overshadow Spider-Man are unfounded. Though Tony Stark features throughout Homecoming, this is Spider-Man’s film from top to bottom. Downey Jr. ably fills an Uncle Ben-shaped hole in the film’s emotional centre, bringing his own daddy issues to their dysfunctional mentor relationship. Unsurprisingly, the shadow of Sam Raimi’s Spider-Man films looms large over Homecoming, with director Jon Watts paying cheeky homage to Raimi’s series more than once. Though Peter’s desire to prove himself to Tony brings new dimension to the character, there’s no doubt that Raimi’s films had greater emotional and thematic nuance. What Homecoming lacks in depth, however, it more than makes up for with a pop sensibility that fizzes with verve and fun. 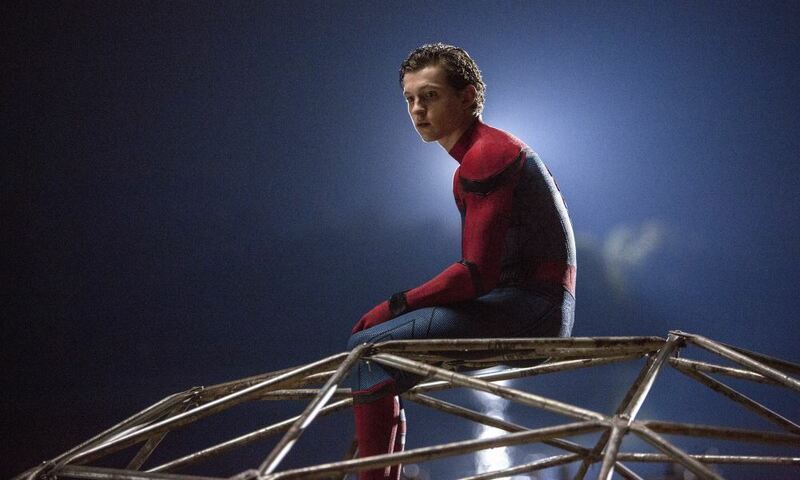 Homecoming smartly avoids the familiar beats of earlier Spidey films, this time with a focus on Peter’s high-school tribulations. The funniest Spider-Man film yet, Homecoming is a true teen flick, its visuals full of colour and exuberant movement. Though he has his fair share of adolescent troubles, Holland’s Parker is ultimately too full of the joys of spring to replicate the angsty moping of predecessors Tobey Maguire or Andrew Garfield. True to Homecoming‘s teen-movie heritage, the diverse supporting cast are an often hilarious addition, with even Flash Thompson (Tony Revolori) elevated above his usual cookie-cutter bully role. Jacob Batolon’s “guy in the chair” Ned almost steals the film from under Holland, and Zendaya proves riotously funny as the sardonic Michelle. Marvel has historically struggled with its villains, but Homecoming cracks it with Michael Keaton’s Vulture, whose blue-collar villain is seamlessly woven into the fabric of the MCU. Though recycling some character beats from previous Spidey villains, Keaton’s inimitable presence nevertheless brings a dark pathos to his Adrian Toomes. Marvel’s risk-averse approach to story telling invariably rears its head with a workmanlike score and some generic cinematography. Still, Spider-Man: Homecoming is easily the best entry in the franchise since 2004’s Spider-Man 2, even if its hip tone can’t match the emotional heft of Raimi’s best entries. Nevertheless, the supremely entertaining Spider-Man: Homecoming is a triumph, and in bringing its most iconic hero home Marvel has hit the jackpot.